Channelize the inventory movement to make the most of your inventory life. Test quality & quantity at every key checkpoint – inbound, outbound, picking etc. With inventory accuracy, you only store less and sell more. Design picking convention of your choice and automate workflows to ship the right orders to right people at the right time. With improved fulfillment cycles, you simply earn improve on credibility and reduce returns. Meet strategic business objectives with the just-in-time approach that lets you handle and optimize resources and ensures positive bottom-line impact. Optimize every aspect including space, labor, and stock flows. Improve labor productivity by offering real-time inventory visibility and reduce the level of inventory process errors caused by trivial paperwork and manual processes; Save both time and efforts of the warehouse staff. Which is the best warehouse management system for online retailers? There are plenty of warehouse management systems (WMS) in the market that can work for online retailers. Orderhive is an excellent option. It is a specialized e-commerce warehouse management system designed for small and medium businesses, to help them face supply chain demands easily. It keeps track of all your inventory stores at multiple locations. With Orderhive, you can track product journey from delivery to the doorstep. It saves time and boosts productivity by optimizing the picking, packing and shipping processes, resulting in faster delivery rates. Orderhive also eases inventory tracking to prevent overstocking and understocking. What are the features of Orderhive Warehouse Management System? Orderhive is a dedicated warehouse management system packed with features. Some of the highlights of Orderhive include providing real-time capabilities of tracking inventory to and from multiple warehouses. Orderhive streamlines picking, packing and shipping processes by generating packing slips and shipping labels. It is even compatible with the latest barcode technology enabling inventory tracking by scanning barcodes. 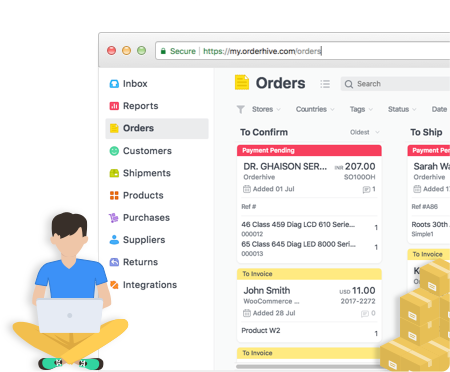 Orderhive also takes care of return, exchanges and backorder processing, so you can know any delivery issue as it happens in real-time. A warehouse management system is a SaaS application that effectively manages warehouse functions. It is useful in managing multiple warehouses, establishing inventory control, and optimizing warehouse space. A WMS supports warehouse operators in their daily warehouse operations like planning, organizing, staffing, tracking the movement of inventory and employees inside and outside the warehouse. What are the benefits of using a WMS? There are countless benefits of using a warehouse management system. The biggest benefit of using a warehouse management system is reduced operating costs, process optimization, and warehouse space management. A warehouse management system maximizes labor resources, facilitates demand forecasting and stock planning. Does Orderhive consolidate stock in multiple warehouses? Orderhive keeps track of inventory stored in multiple locations under a single platform. In Orderhive you can add and manage multiple warehouses, smartly allocate stock to different locations and also set default warehouses for receiving shipments. Can Orderhive be customized according to my business requirements? Orderhive is a feature-packed warehouse management system that takes care of most warehouse functions. However, if users require specific add-ons, then yes, they can avail customizations according to their business requirements. Orderhive Plus, the customizable version offers tailored solutions. Does it take too long to set up Orderhive warehouse management system? No, it is super easy to set up Orderhive warehouse management system. Sellers do not require any extra hardware or too much IT involvement. All you need to do is sign up, select a purchase plan and you’re good to go. Once you have created your Orderhive account, you simply need to add your warehouses and stock details to start selling in no time!